Modern loyalty and rewards programs are abundant and varied. But to differentiate your own business in today's crowded market, you have to develop a unique and compelling value proposition to attract new customers and increase sales. Related: Does Your Value Proposition Need a Checkup? The ideal value proposition is a mix of a company’s strengths, customer needs and competitive differentiation. It combines the uniqueness of the brand with the top priorities of its customers. Attract new customers to the brand? Match the current brand promise? Allow the majority of customers to access its benefits? Align with the changing competitive landscape? If the answer is "no" to two or more of the above questions, it’s probably time to consider creating a new or updated value proposition. After all, a strong value proposition can be the difference between stagnation and growth for your business. Below is the successful process our company Synchrony Financial and its retail clients use to create award-winning value propositions that attract new customers and excite existing ones. This process results in a value proposition that can be customized to a specific brand’s strategic goals and brand experience. Proactively gather customer feedback, understanding current and prospective customer needs, wants, delighters and pain points. This can be done using both quantitative and qualitative survey methods. Ensure that your survey methodology includes actionable insights, with program details specific enough to drive behavior. As part of this step, perform competitive analysis -- understand other programs that are in your competitive set and the value they provide to customers. 2. Map the customer experience. The brand promise and customer experience are key drivers of the right value proposition. For example, for retailers with customers who seek low prices above all else, a high-touch exclusive value proposition may fall flat. Not all value propositions work with all populations. 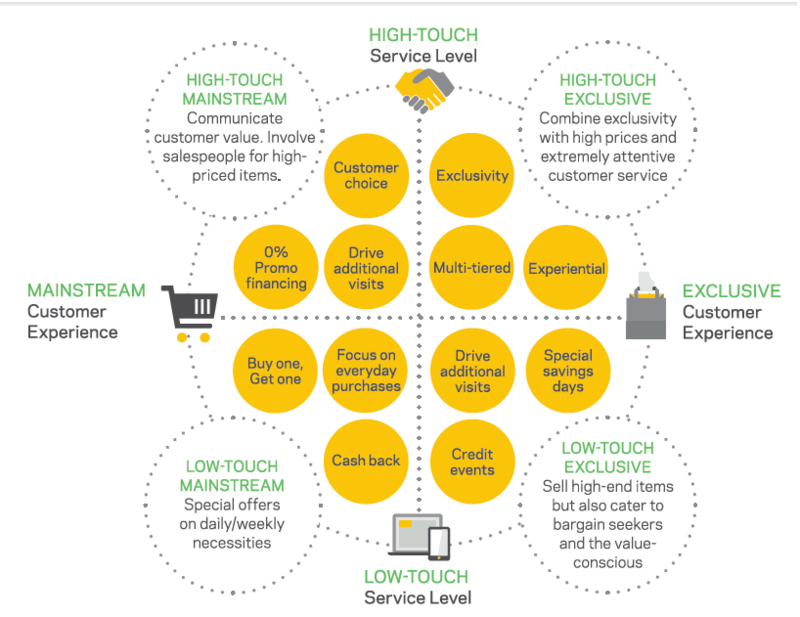 As the following customer experience graph shows, there are different structures that resonate with different brand experiences. 3. Build several distinct value proposition concepts. It is often helpful to create several distinct structures to discover which combination works best for the customer and the brand experience you want to project. These structures should be tested with current and potential customers. Focus groups are an excellent way to test concepts at this stage. Related: Want to Stand Out From the Crowd? Know Your Unique Value Proposition. 4. Analyze benefits versus costs. Perform financial analysis to assess the projected financial benefits of the new value proposition, versus its anticipated costs in order to optimize profits and losses. It is essential that the right financial model be used and that correct assumptions be made in forecasting the anticipated benefits, costs and returns of the new value proposition being considered. This is part art and part science. It can be an iterative process, but getting it right is often the key to success. Best-in-class value propositions deliver benefits over the long run, resulting in new customers, loyalty, reduced attrition and incremental sales. Value propositions and customer engagement channels have evolved over time. Substantial growth in online and mobile shopping, as well as social platforms, must be taken into consideration when creating the ideal value proposition structure. The value proposition should address how a customer shops across all channels and ensure a seamless brand experience. Prior to launching the new value proposition, many companies will test the program or experiment with different structures through several test iterations. One of the benefits of a pilot is the reduction of risk associated with a full launch. It serves to shed light on executional elements of a full launch and can provide insights into customer reaction and uptake. The successful creation, development and launch of a new value proposition can re-energize a brand as well as engage customers. The success of the value proposition process starts with organizational commitment to the outcome and is dependent on process rigor and functional expertise. An expert in this process should be engaged to ensure that effective strategies are created, tested, analyzed and implemented to achieve the goals of the organization.